Nanjing Art Gold Foil Factory is a professional manufacturer in gold foil handicraft and gold foil decoration . It is located in Nanjing, the birthplace of Chineses gold foil, which is about 300kms away from Shanghai in eastern China. Being a specialist in gold foil, Nanjing Art Gold Foil Factory has 10 years history in this field. With the high quality, we export our gold foil products to more than 20 countries & area in the past 5 years. Besides of gold foil handcraft, Nanjing Art Gold Foil Factory also deal in gold foil decoration work. 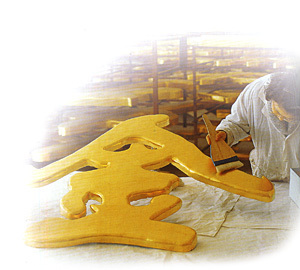 Gold foil decoration is widely used for building, garden and statue etc.